Learn: What are the POST and GET Methods in JSP (Java Server Page), what are the differences between them? Examples of GET and POST methods in JSP. If you don’t know the actual difference between POST and GET method requests, and you are still using them with no idea means you are in a right place to find out these. Your data, where you are saving sensitive information like password, date of birth, etc which you want to hide particularly. So in that case you should use POST METHOD in the form action, where your data transmission will be hided over the header level. Your data which is not sensitive and you don’t need any information hide through the header level you can use GET method, and use it for rare, because it is not recommended to use GET. 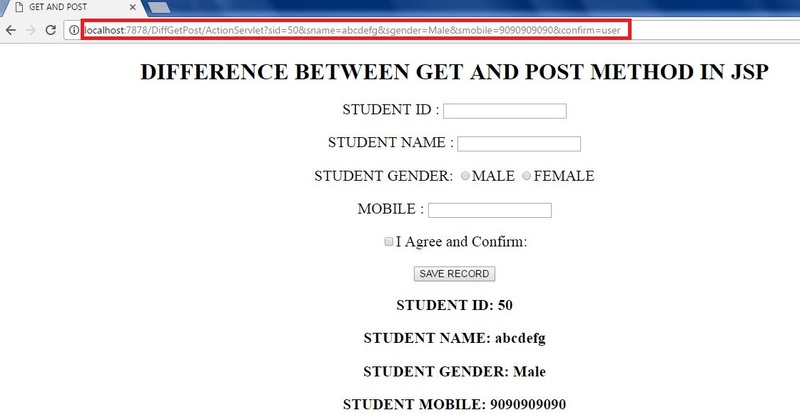 Here we are taking the inputs from a student who is filling the online application for his examination and here we placed form action to ActionServlet and method request to POST. Soon as the user submits the form with method request POST, POST method executes and you can find the header level that no data of yours is shown. 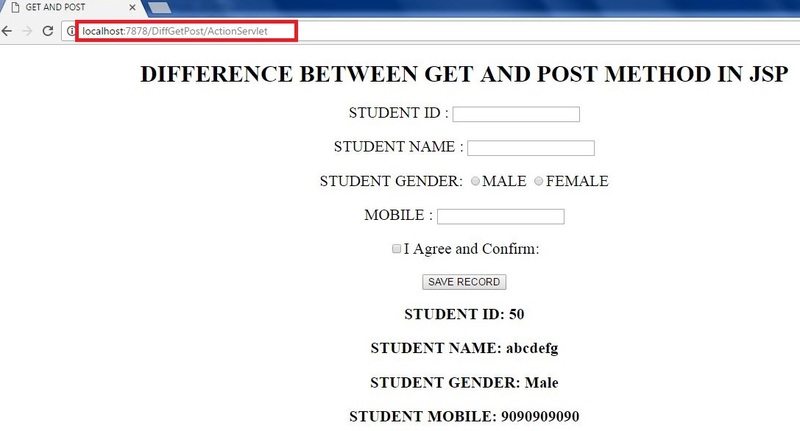 Uncomment the GET method and submit the form again, so that you can observe the following output with the values shown in header level. And you can change the value in the address bar and press enter again, and then your values will be shown in the page data.